This tutorial provides you with a foundation for working with Adobe Illustrator templatelayers. It is the eighth lesson in the Adobe Illustrator CS6 Digital Classroom book. For more Adobe Illustrator training options, visit AGI’s Illustrator Classes. The most common way to create a template layer is upon import, while placing raster artwork into Illustrator as a template. Select File > Place. In the Place dialog box, select the artwork you want to import and select the Template check box in the lower-left corner; then press Place. The file is placed on a locked layer and is dimmed to 50 percent by default, so that you can clearly see any paths you draw over it. The second way to create a template layer is to convert an existing artwork layer into a template. 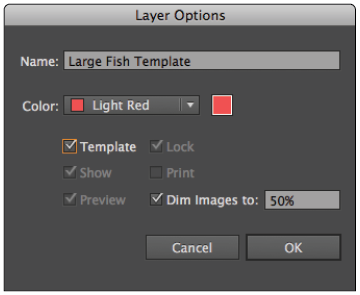 Double-click a layer name in the Layers panel. In the Layer Options dialog box that appears, select the Template check box and press OK. The layers icon in the Visibility column changes from the Visibility icon ( ) to a Template icon ( ), and the layer is automatically locked. If you convert vector artwork to a template layer, it will not be dimmed. manually trace an image with ease. Try converting the Large Fish layer to a template layer and trace it manually, using any combination of the path and shape drawing tools.